A story I had to share for those that love to read a little deeper… and do not mind a lengthy blog! This is connected to this weeks theme: “When you come back can you bring me a balloon?’ This is Part I; which you do not have to read before Part II. It is a story of hopes and faith. 4 years ago I changed my life. I bought a worldwide ticket and travelled for over a year. I really feel these travels, these experiences, these places, these people in the lining of my skin. Even now. Memories simmer and then come to the forefront of my mind. It carries me through more challenging times and is a reminder of the precious gifts of time, the connections we can make when we are open and the adventures that happen when we have hope and faith. For truly we are all angels temporarily hiding as humans. Momentarily the bus seems to be speeding along the jungle and surrounding waters of Vanua Levu. Children in their school uniforms, aboard buses, walking on trails that only become apparent to me as they appear from jungle, a horse stood alone in water. A man with a huge grin for me boards with two little girls. I recognise their gorgeous braided hair from the night before. I had visited this family to join their Diwali celebrations. The bus loses the momentum as it attempts a hill, chugging along now we move slowly. 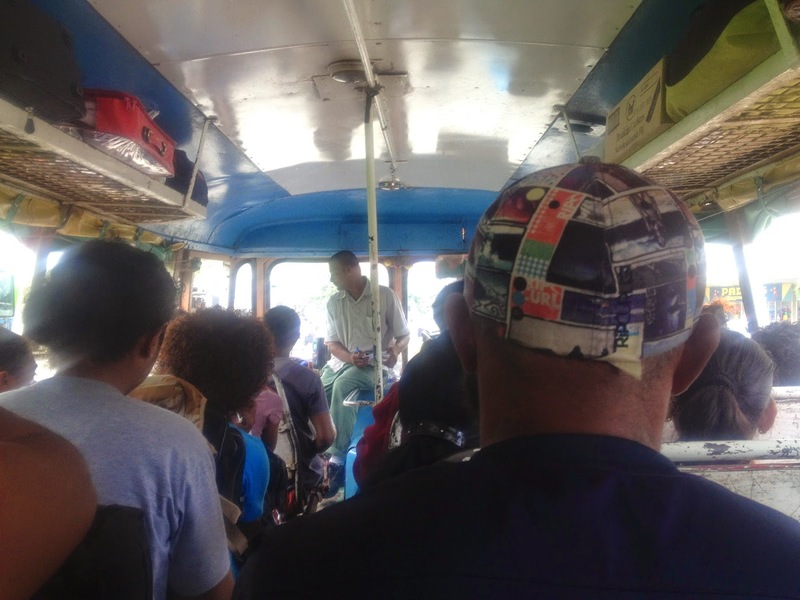 Generally it is a bumpy ride on the 3 hour journey from Savusavu to Labasa in this old vehicle, but the pot holes are not so bad- this is a newer road than most on the island. Steam from the hot springs cascades through the palm leaves, roosters sound both in the distance and nearby, children laugh and play in the schoolyard opposite, soft, mellow and upbeat Fijian folk music plays from a radio, dogs yap and birds sing. A small child walks by, with a back pack that seems bigger than her, smiling shyly and bursting into a grin and a wave when I shout, “Bula!” from my porch side spot. The sun is hot. Air is steamy, ands thick with the sweet smell of frangipani blossom. The flowers are in clusters, bouquets within the tree, a sweet offering from the land. It is lush and tropical. Others amble slowly by, a man with a pitch fork thrown over his shoulder and a machete (standard) swinging from his other hand. A hen and two chicks that live under the house, traverse the grassy lawn. I contemplate the day ahead but realise I do not have to commit to anything; I have long ago lost the go-go-go mentality that has governed me. 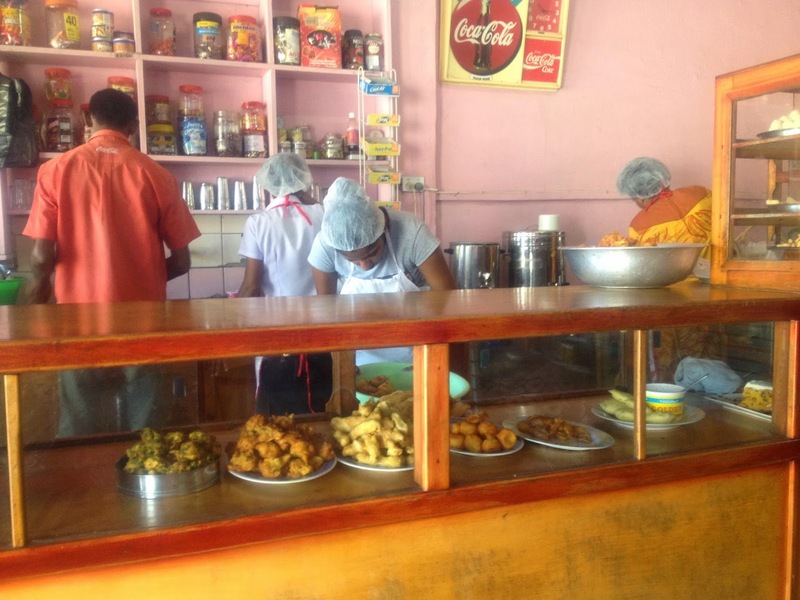 I arrived in Labasa on the island of Vanua Levu 2 days ago and wondered if I had made a mistake when I made the decision to leave Liza in Nadi market. Long Beach was so alluring. But the pull of the north stronger. As I waited for my plane I listened to an Indo-Fijian and Fijian woman chat away, marvelling at their immediate friendliness and ease of conversation. People like to chat here. And they are not kidding when they call Labasa ‘The Friendly North’. This is something that the people of Vanua Levu are clearly proud of. The newly formed friends draw me into the conversation. The Fijian woman is a large, lovely lady. She is returning from a business meeting; laptop in hand, a huge sandwich and gorgeous brightly flowered dress, topped with a wide smile. The Indo-Fijian woman lives in New Zealand and returns for a funeral. She is away from her husband (an arranged marriage- she is very happy and he is a good man she tells) and son for the very first time and is very sweet. She is glad she has someone to talk to as she waits. I share my plans, which turn out to lack substance. I am heading to Savusavu, I tell them. I will catch the bus. I realise that the Fijian woman is on the phone checking the bus times for me as she is concerned as they are less regular on Sunday. We have been chatting for less than 5 minutes and she has already asserted that she will take me to the bus station in her taxi when we arrive in Labasa. As I leave Vanua Levu in the teeny plane, the sky appears a clearer shade of blue, the jungle more vibrant and emerald green. Things are heightened as I traverse alone. The land comelier than if I had been in company and emotions similarly amplified. I trust in here. I feel so open, free and sure it will all fall into place. The airport is like a shed and our luggage is pulled off in a pile upon a large wagon, pulled by the few ground staff. There is a flurry of activity as people grab their cases and my Fijian lady ensures I have my things an we head out to the taxi. The driver and herself both give me their phone numbers and she invites me to come and spend Thursday with her when I return to Labasa for my flight back to Nadi on Friday. She insists on paying for the cab and gets the driver to take me to a spot nearby for coffee, as the bus is likely to be in 3 hours. Though this time is somewhat debatable- everyone seems to think something different- it has now been narrowed down to 3:15pm or 4pm. At 11pm I have some time to kill. I go to the cafe and it appears to be Indian food. All they have is sweets they tell me. Okay. There is a flurry of activity and lots of dough, sugar and hands moving fast, the ladies in their hair nets and aprons chatting. I am the only customer and I wonder whether this is their baking day. I later learn that they were most certainly preparing for Diwali, their Hindu New Year festival that would take place on Thursday. I have never really tried Indian sweets and having not eaten anything but an apple I fear I have no choice but to indulge. I order a coffee and they fill me a little brown paper bag with an assortment of the sweetest, rich, dense baked goods I have ever sampled. My coffee is weak, sugary and creamy with full fat milk. I drink black coffee. I have already made this mistake ordering coffee in Indo-Fijian cafes and restaurants. Yikes. I head to the supermarket to buy a carrot; hoping this may counteract the dairy and sugar overload. I go back to the bus station, which is a temporary stand. I sit on a bench and feel inconspicuous. Some are milling around, both Fijians and Indo-Fijians and I am the only Westerner. I stick out. But it feels okay. I have potentially four hours to wait. A bus pulls in and a younger crowd seems to amble across the road, boarding slowly. Two girls sit beside me and smile. They ask me where I am going. If I am alone. They are seeing their cousin off- he has been here for the weekend and returns to school in the west. This explains the predominately youthful passengers. The girls are sisters. They are 18 and 19, do not work, have finished school and they will ‘accompany’ me until my bus gets here. They introduce me to people they know as their friend and I am touched by their kindness and generosity of time. We go for a walk to get me some real food for the bus. They show me the sights of Labasa. There really is not much to see. There is one strip of shops that are all boarded up and the market is closed. they take me to a fried chicken spot but I explain I am veggie and we collect some stir fried veg and rice. Awesome. Rebecca wants to marry a European man but is checking out a good-looking Fijian boy at the station when we return. Her sister is a dance-aholic and hits the nightclubs. 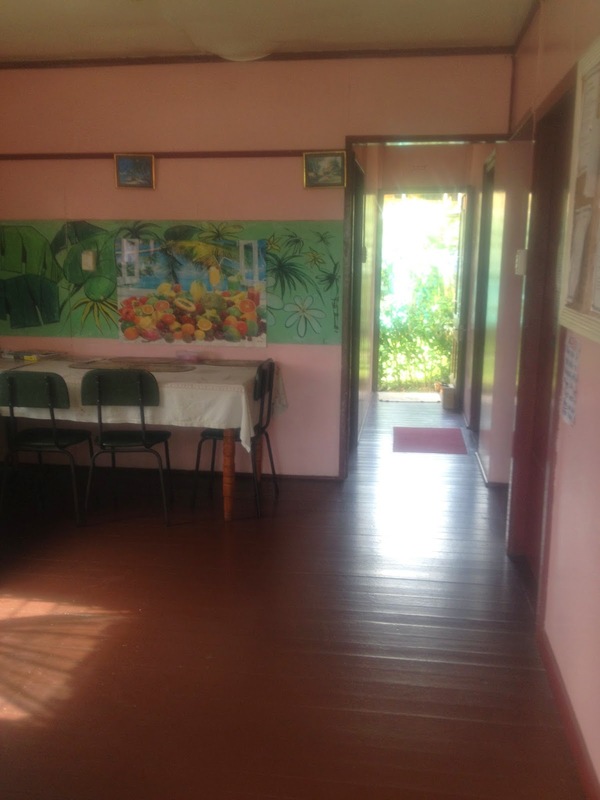 They show me this spot and it looks quite dingy, with a pool table and a few young Fijians lazing inside. They share a bed at home and Rebecca often wakes to find her sister not there and knows she will be out dancing. It is nearing the alleged time for my bus and I tell the girls they should go and enjoy their afternoon, I will be fine. 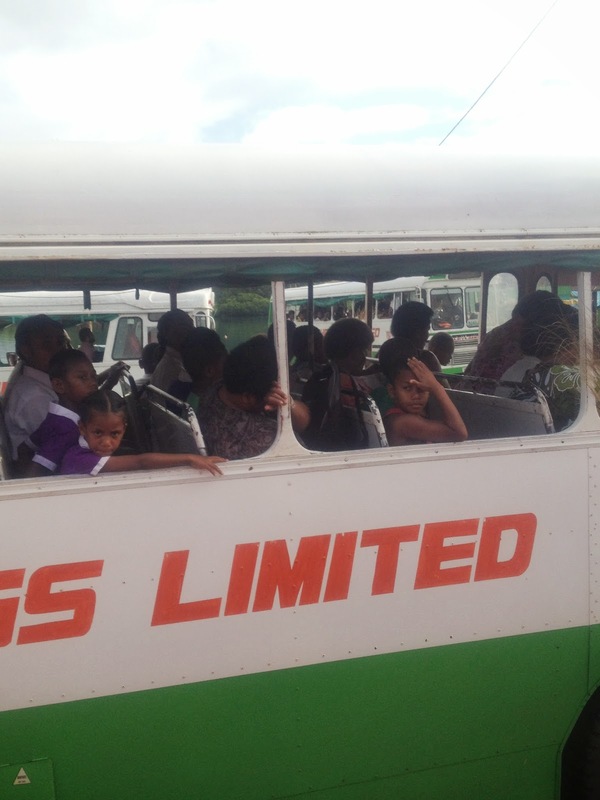 They help me carry my bag and deliver me back at the stop, finding some others going to Savusavu so I am not alone. Wow. I eat my veg as I am unsure if it will possible to eat it on the bus. The bus arrives and I negotiate my way on. 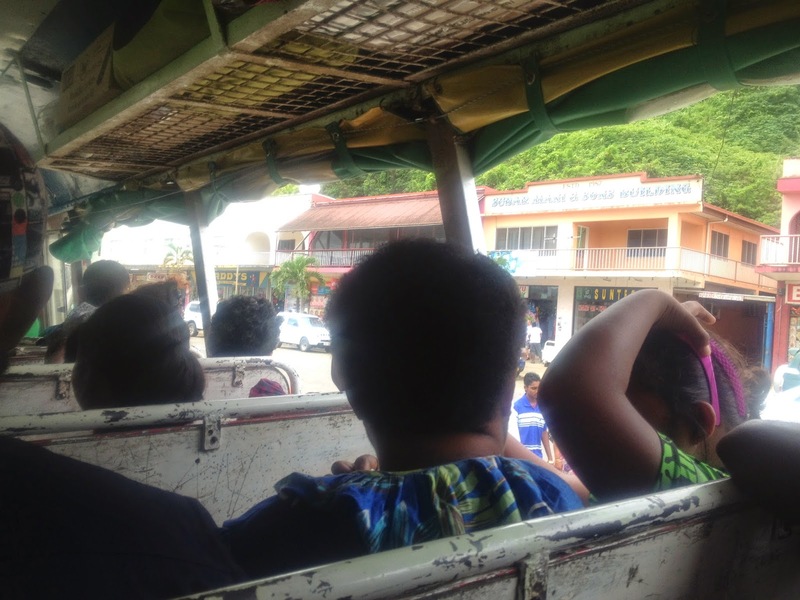 Paying $6 Fijian for the 3-4 hour ride ahead to the bottom of the island. There are 3 and 2 seaters and a lovely Indo-Fijian with a sweet voice and manner sits beside me and a Fijian man beside her. 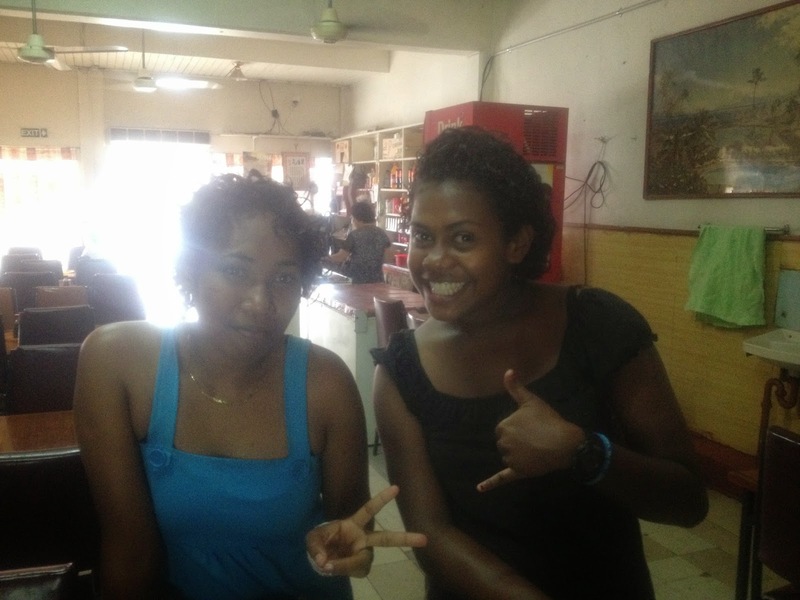 She is proud of Labasa and starts chatting straight away. She is very knowledgeable and interesting. She is in a bit of a sad situation currently. Her daughter is a doctor and lives in Australia and she has no way of contacting her. 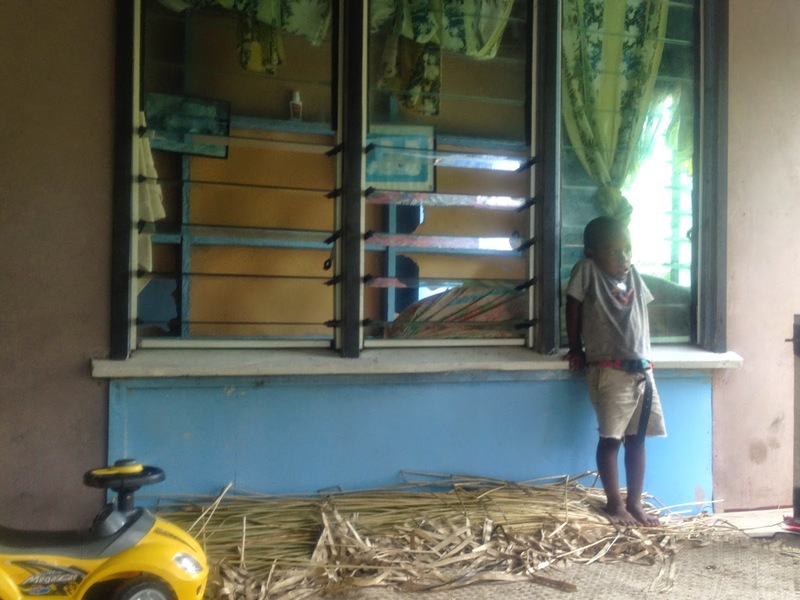 She waits here for her in Labasa, sure her daughter will come and find her. Her husband broke her heart, cheating on her and now lives in Suva. She used to be wealthy and shared her home with travellers. Loving how she surprised them with her Indian cooking. Her husband not only committed adultery but also cyphered her money form her dressmaking business. She has been looking for a new place to rent but there is nothing. 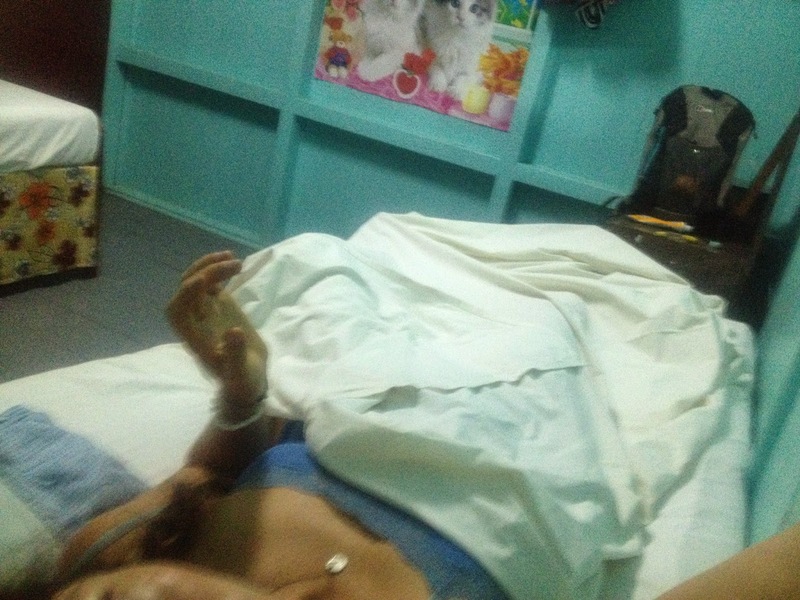 She wants to stay in LAbasa and has to be out of her place this week. It is Diwali and had it not been for her circumstance, she would have loved to host me for the celebration. We look at some of my travel photos and she is so lovely, interested. I notice the Fijian man is also looking as we flip through the shots of the desert. She gets off the bus outside of the town and we hold hands, both giving each other a comforting squeeze. There is no actual stop, people just ring the bell and the bus pulls over. The Fijian man and I are now beside each other and people standing shuffle in the seats. He sleeps. The journey is long, bumpy, winding and I study the map in the ‘Lonely Planet’. When the man wakes he shows me where we are on the map. Over half way. We chat a little. He has been in Labasa town to play in the semifinal Rugby tournament on Saturday. I share with him my Rugby experience in Latouka. His hand looks badly injured. Skin torn off on his lower palm when he took a slam and hit the ground. He wants to get to the jungle for aloe, the cream the medics on the rugby field put on it (and no ice, apparently!) did not cut it. I notice his middle finger is bent towards his palm, almost touching it, and this is certainly a past injury never to be rectified. 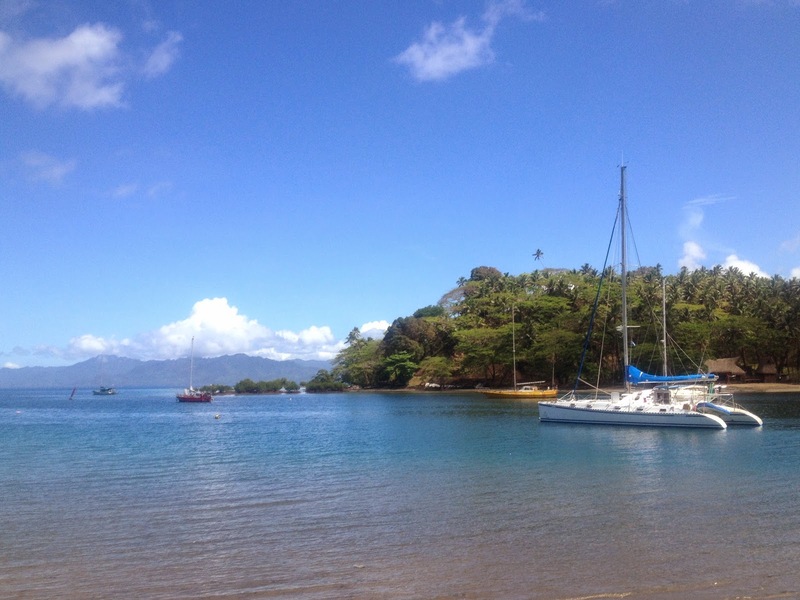 We chat intermittently but more in depth as we approach Savusavu. He is from a nearby village, where he intended to return this night. Instead he tells me that he will walk me to where there are places to stay and if I would like, I can go with him to his village tomorrow. He is utterly gentle and there is a special warmth that emanates from him. I trust him. His name is Sakuisa, but many people call him Q. He helps me with my luggage and we walk down the dark main street of Savusavu. I had shown him the Lonely Planet and he knows where the places are- this town aint big! It is up to me, but his Aunty has a place and it is the cheapest in Labasa. My aunty will like you, he says. She has many stories too. Let’s go, I say. I would much rather my money go to someone in his family. We walk across a field in the darkness. I see steam rising and realise these are the hot springs I have read about; volcanic activity that simmers below the surface. Some people stand around them. They are cooking, Q informs me. We approach the small house and there are people sat on the porch. Here I meet Elizabeth. There is room for me. But do I want to camp, she enquires? No! That is my yoga mat that Q is carrying! She laughs. It is a great laugh that punctuates the rest of my days here. Q is quite and reserved and helps me with my stuff to the door of my room. Good night, sister, he says. God Bless you. I bless him back and instinctively give him a quick embrace. He receives the hug and nods shyly as he disappears into the night. On the walk here we had arranged to get the 10:30 bus that will take us near his village; we will meet at 9:45 and he agrees to me treating him to a morning coffee for his kindness. I realise that he now will walk back to his other aunty’s to stay. He pointed it out as we were nearing Savusavu; I am certain it is at least an hours walk away. I sit on my bed. I am amazed, touched, humbled. I come from my room, befuddled by my journey and chance meeting. I ask Elizabeth if it is too early to go to bed. If it is a bit crazy. Some Fijian folk also staying here sit on the porch and we have a brief conversation. Yes! It is crazy, she laughs. It is 7:15pm. I am knackered though. I climb in. It looks a little different in the morning. I love the communal area, the happy pinks and brightly coloured posters. I run in the morning- my failsafe for getting the lay of the land. A lot of friendly greetings and children heading to the school across the way. It looks beautiful in the daylight. A South Pacific port nestled against a sweeping bay, with a backdrop of hills sumptuous with tropical greens and hibiscus flowers. 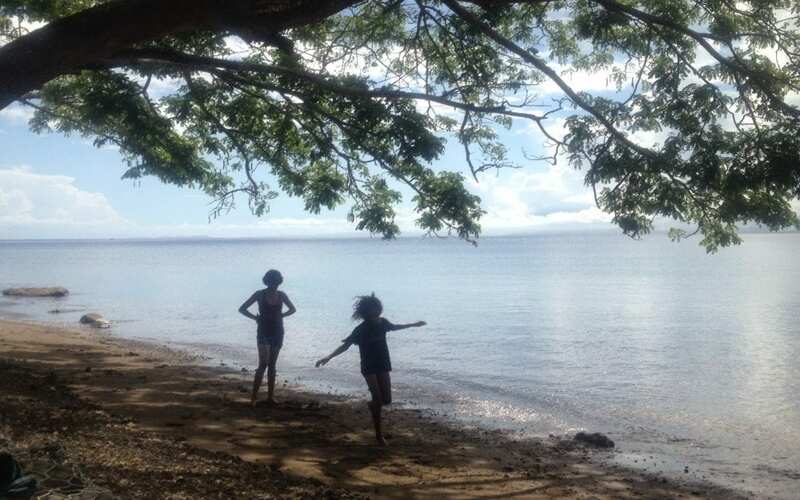 Apparently there is a large ex-pat community; they have been seduced by the laid-back vibrations of this pretty spot, the simple life here in Fiji. I guess they have their yachts, boats and extra cash to live in the comforts that they know. I learn later from Elizabeth that they are not very friendly, or immersed in the culture of Savusavu and Fiji. They live on the outskirts, having snapped up a piece of land in the surrounding area. I am aware that I stand out here; occasionally, over the next 5 days, I see fair skinned people but they are few and far between. I head to the ‘Copra Shed’. Last night Q and I had walked by and the fairy lit up shops and cafe looked appealing, if a little un-Fijian. I later realise that this is mainly frequented by the ex-pats. As I leave post coffee and papaya and pineapple shake, I bump into Q. We had arranged to meet at 10 and it is 9:30- we decide to walk and see the town and go for coffee. He is concerned with how I rested. He has been up since 5, which is pretty standard here. I ask him what I can take to the village. Sweets for the children? We go and buy candy, some snacks for myself and then have a coffee together. We join the hubbub in town. The station, where the market is thriving and people are scattered around on the grassy areas. Some selling roti, some relaxing, others meet and shake hands. Many people stop and speak to Q. They are often a relation. It becomes a running joke- is that a cousin or an uncle? We head back to the Copra Shed (because this is the place for decent coffee and perhaps where Q thinks I may like) and sit, chat and look at the boats. We head to the station and board. I have to sit behind Q and I feel his silent strength and kindness that surrounds him. The bus takes just under 2 hours and we get off in the middle of the jungle. He prefers to go to the village this way. I laugh as we walk single file on what becomes a trail only because I follow one who knows it. I had thought I could get here myself! We emerge on the beach. We look at hermit crabs. He shows me how to blow on them to make these shy crustaceans emerge from their shell. 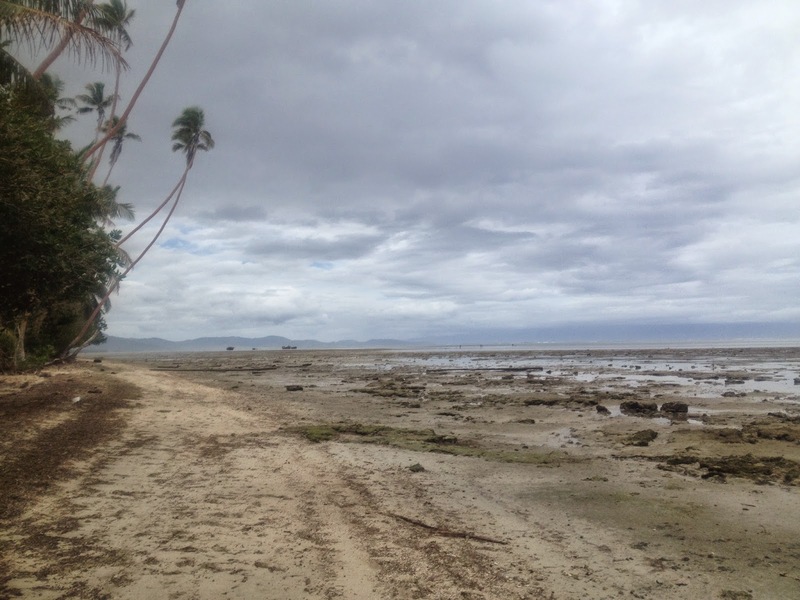 Q loves the view from this walk to the village because you can see Taveuni. It is spectacular. We hear something- it is his brother. 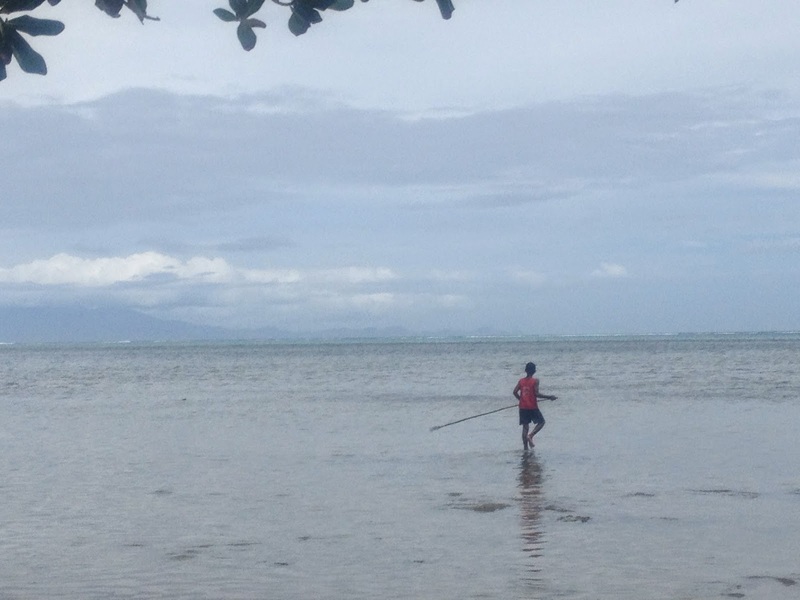 He walks along the beach with a machete and some fresh, wild chillies in hand. Q introduces me and they speak in Fijian. He will go and collect some coconuts and see us soon. We continue along the beach. We soon arrive at the village, just beyond a row of trees. The houses are built not too far from the beach; children are on the beach and Q speaks to them. They look at me and smile, saying ‘hello’, following me with their curious eyes as Q guides me to his sister in law’s bure. 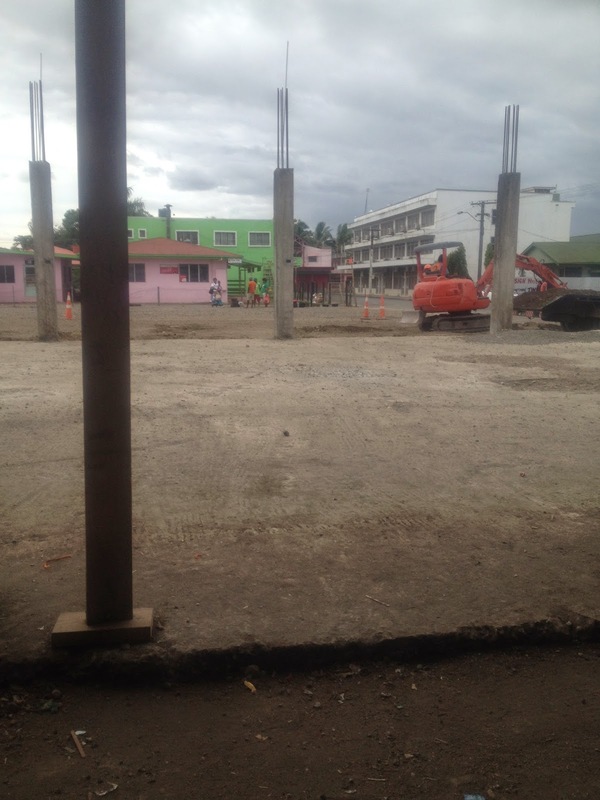 His brother is in Labasa, visiting his eldest daughter who is in school. We sit and chat. 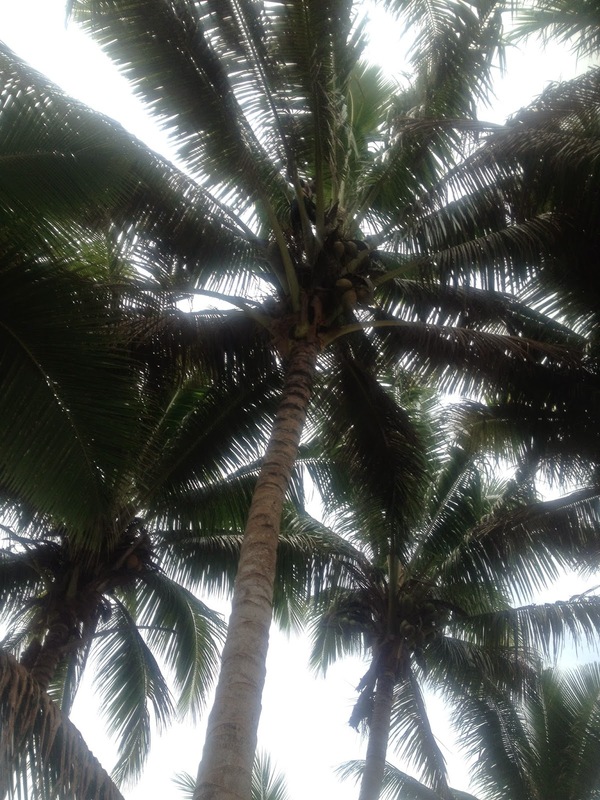 The children want to get me a coconut and we drink on the beach- the way this child climbs to the top of the tree is incredibly skilled; supreme confidence and speed. 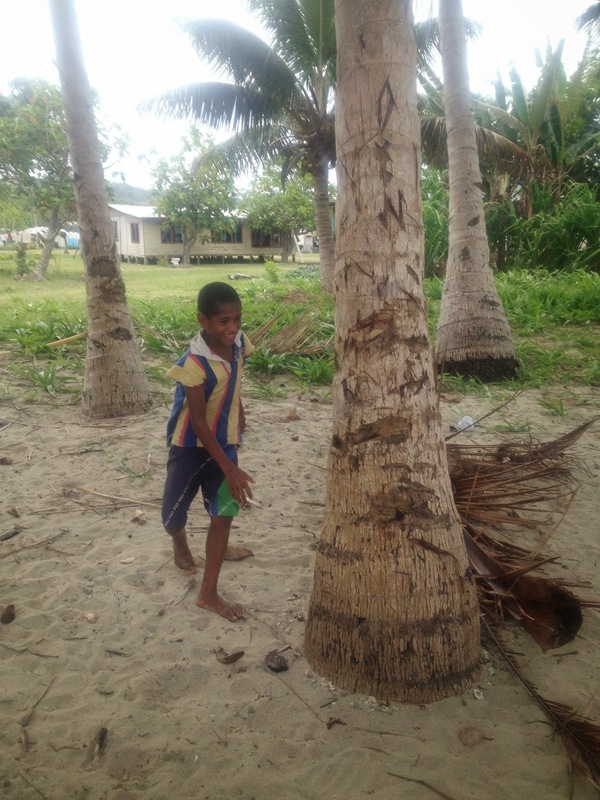 Children use machetes to open the coconut. The children grab the toffees by the handful and chew wide eyed. I worry about the intense sugar hit these kids must be experiencing. Star is particularly keen and devours a substantial amount. he wants some of my coconut too so we share it. 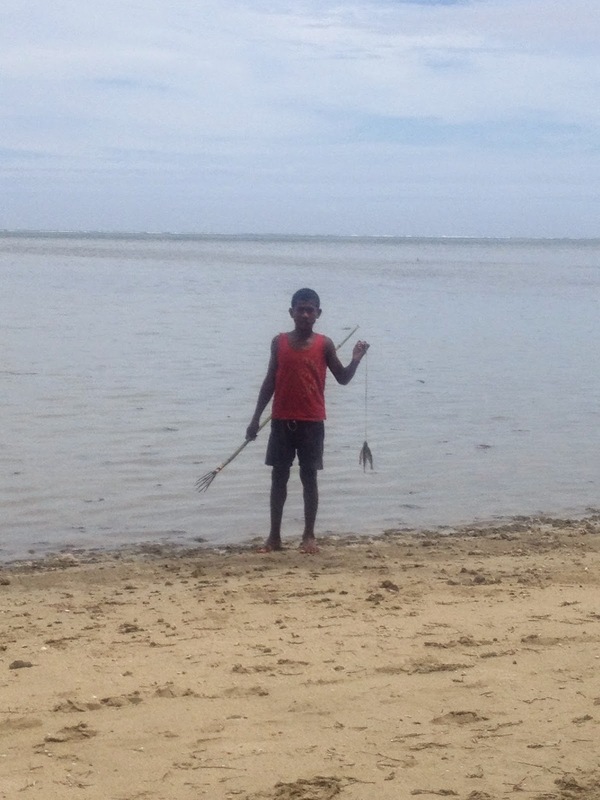 Q and I go for a walk on the beach and watch one of the village children spearing fish, with patience and determination. His brother arrives from the jungle, a sack of coconuts over one shoulder, his machete in the other hand. We all sit on a log and chat. Q is talking about me and the travels I am undertaking. They fall into English at points and flit back to Fijian. When we return, I ask Q about the shed here with all the coconut shells are piled up, drained of all their goodness. It is the copra mill. It is extremely hard work for the little money they receive for the gorgeous oils these fruits create. 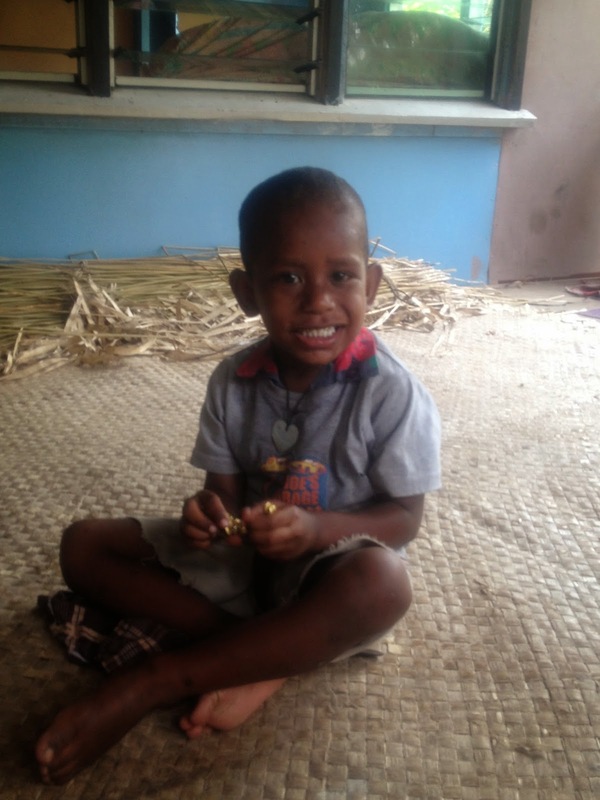 When we return to the bure, Q’s sister-in-law is reading a book of bible stories in Fijian. It is dog-earred and looks like an edition from the 1970’s. She would like to cook me something. She tells Star and his little friend off for appearing hopeful as I rustled my supermarket carrier bag, and Star gets told off for continually standing up (I realise later that it is polite to be seated and keep heads at the same level, or lower, particularly for me to keep my head lower than my hosts), and for accepting my offer of carrots. They eat these with equally wide-eyed wonderment as the toffees. Carrots, although a root vegetable, are not common in the village and they gnaw with curiousity, studying the vegetable and then eating it in a fashion of corn on the cob. The communal sense of living forms the cornerstone of village life. Children run freely between homes and they are entrusted to behave, play and work (of course the village is a safe haven for roaming) but there is a lack of that ‘helicopter parenting’ that perpetuate the parts of the worlds that are more familiar to me; children have the freedoms that I think are similar to the liberties and childhoods described by my parents’ generation. Q grows cassava, yams and courgettes. He scoped out his farmland 2 years ago and he has made a great success- the land is arable and he is an adept, evidently successful farmer. 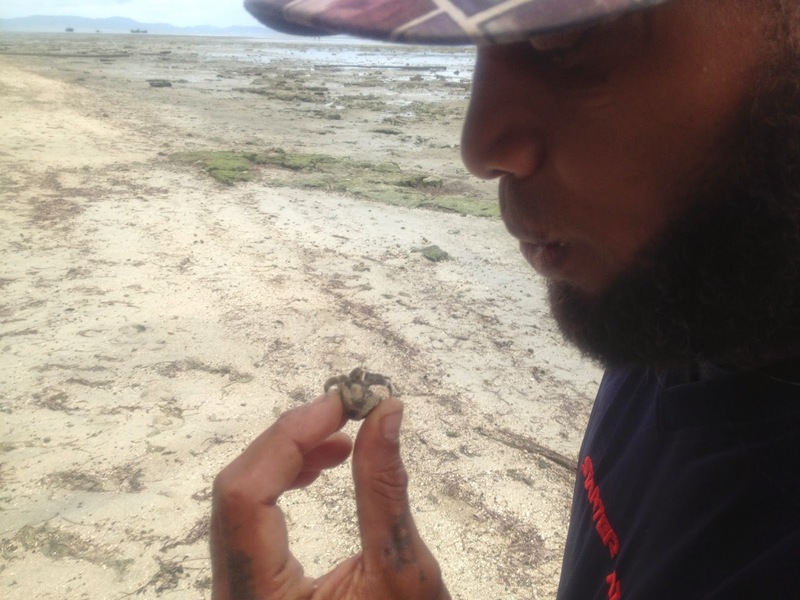 His friends and family both felt like it was a it of a crazy idea; he had been a city boy for many years, living in Fiji’s capital city, Suva. It seems there were signs, and of course his heart, he listened to. 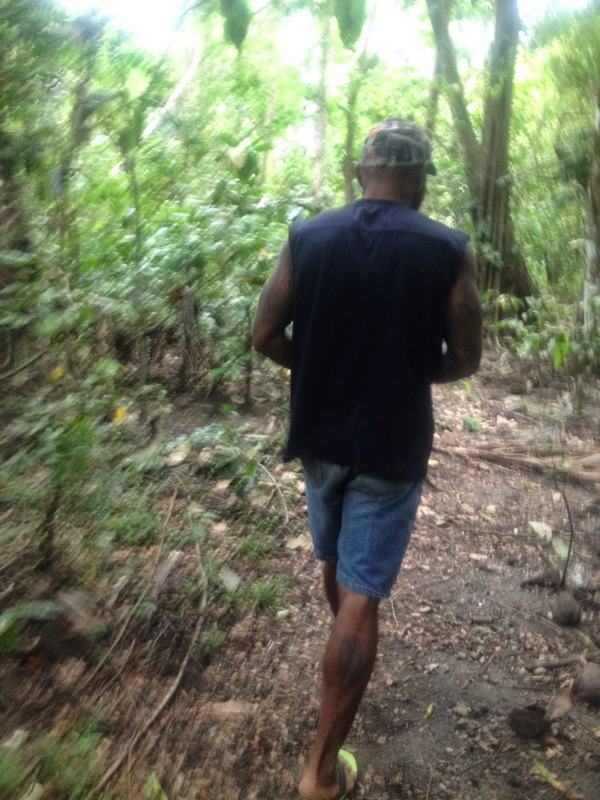 He plans to farm here for a while longer but would then like to head to Taveuni, this is where he actually will own land, as inhere are papers to prove this. Q stays at the farm for months at a time. Alone. It is a 2 hour uphill hike that requires hiking boots. 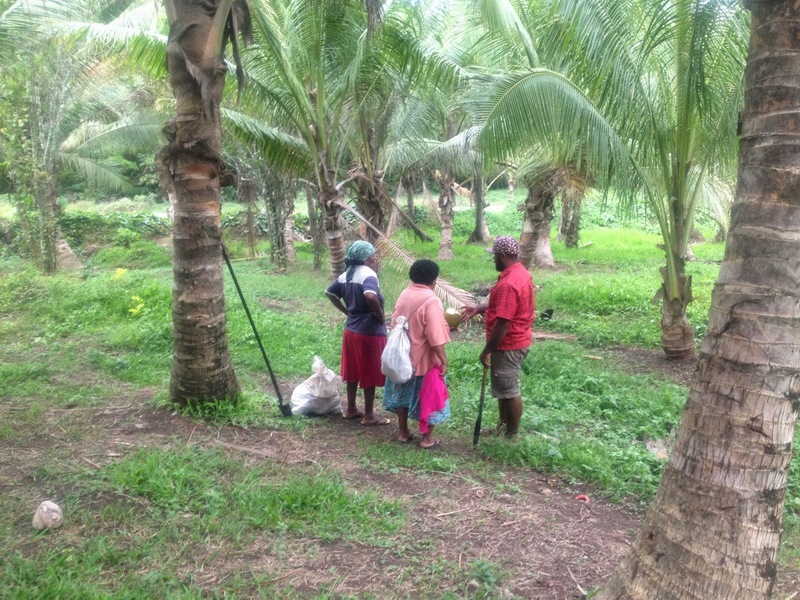 Foolishly, I had presumed the farm was in the village and thought I would be able to go and appreciate Q’s endeavours and hard labour; I would have also loved to see these Fijian crops in abundance. His favourite crop is courgette- a little trickier to grow but it brings in the money. So he is solitary for weeks and weeks, coming to the village and at times into Savusavu or Labasa. His brother sometimes join him. He is used to his time here alone, where he has erected ‘accomodation’. There must be animals? Yes, Jess, but there are. The wild pigs and birds, they know me. He cooks his food and farms. A big change from his life in the city. I know not what exactly made him decide that this was the life for him but he appears to be completely at peace and connected to the nature around him. throughout the day we spent together I learn about him, he about me and we hardly stop talking. When we do, the silence is sweet and comfortable. I know he is divorced, without children. He is 34. He has amazing tattoos that tell a story. A whole sleeve on his arm. It is dedicated to his friend that was killed in the 2006 coup. Beaten to death like a piece of meat- the beating he was given was for playing loud music. This happened in Suva. He tells me this as we sit at the ‘bus stop’. Having left the jungle and bid farewells, the bus is expected to pass through anytime between 4 and 5. We do not have to wait roadside but on a bench fashioned form two tree stumps and a plank of wood. It is set back in the jungle on land belonging to the family. Q waits here and can hear the bus coming; he will run down and hail it. Q comes from a big family. He has been telling me snippets about an older sister who lives in Eurpoe. She works in Brussels. We talk often of her; intermittently she crops up in conversations. 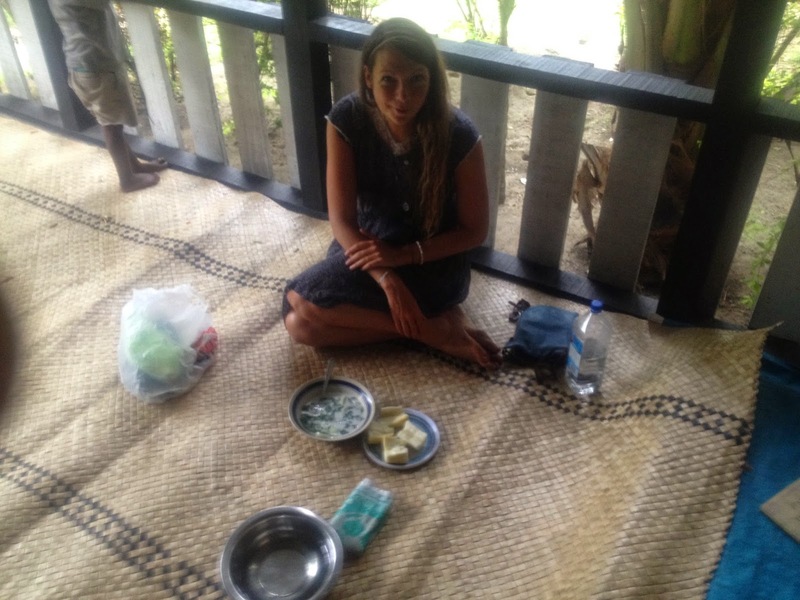 I ask whether he may ever visit her, how she finds the food, is it ever so expensive, does she return to Fiji. It is only now, after our day together that he tells me that she died and they buried her 14 days ago. This is why he has the beard (Elizabeth had mentioned that she did not recognise Saquisa approaching the other night because of the beard). He and all his brothers will let their facial hair grow for 100 days and nights as a sign of respect. This is why, Jess, you will see all my brothers growing their hair. The 100 days will finish on the 24th of December. Q. I am so sorry. This is just so sad. Yes, yes. But this is life, Jess, he says in his gentle and soft way. I wonder if he may have tears in his eyes. It is life, I have to agree. But, Q, it does not mean that your heart does not hurt or will take time to heal; to lose a sister is devastating. Yes, Jess, this is true. After the talk of his friend, his sister and death, the jungle has become somewhat still. The tropics have bestowed a humble hush, respecting and holding onto this moment of Q’s sadness. After all, this jungle and land knows him. He jolts up, runs to the road. There is a bus but it goes in the opposite direction to the one I need. But Q shouts back to me that his brother was on that bus and he will come to us. All of his brothers have looked so different and in temperament and character they vary greatly. This is the brother that has been in Labasa and he is funny and jovial. He has his overnight bag and news that we have not missed the bus- it did not pass him on the way from Savusavu. He sits with us and we chat. He tells me of a German visitor that he brought to the village- they are great friends as a result. Well, they have not seen each other since but this is the beautiful thing, once welcomed in these parts, it is set- you are like one of the family. He accumulated this German visitor as he was biking alone and had come fear from his resort. 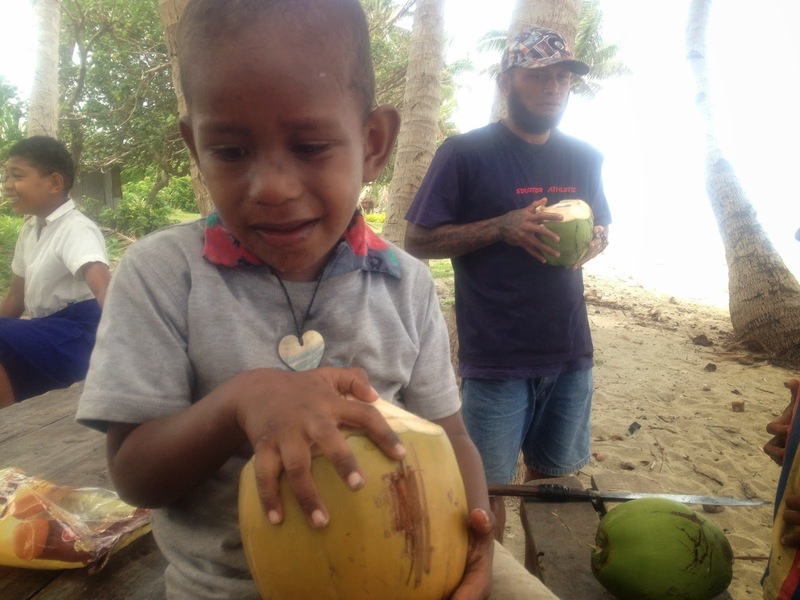 He took him to the village and enjoyed some coconut and banana. He reveals that he made a joke about the bananas and the German was so tickled by this, he invited him as his guest to the resort for some fancy meal that his colleagues were having. He wanted him to tell this joke. For a minute I am worried it may be dirty and I think I will feel uncomfortable or that I just won’t laugh because I never get jokes. It is about the size of bananas here. Which apparently perplexed the German. Why? Why are they so big? He questioned. Well, was the response, they are the big brother of the normal sized banana. We all laugh, a lot. Me. partly out of relief that I get it and it is not a dirty joke, but also because Q’s brother has a great laugh.This is exactly my type of joke! And I have something that is similar from Thailand. So I tell them. An arrogant French man that was on a Thai cookery course we were doing, questioned the Thai lady about the small size of the bananas in Thailand. To which she responded (and I can still her her cute response in her lovely voice and manner), Because we are small people so we eat small banana. You are big people so you eat big banana. The French man seemed irritated by this response but I was amused. So were Q and his brother. A rustle from the jungle causes the three of us to turn round. Q announces the arrival of his grandmother and her friend. These elderly woman hobble to the bus stop. It is amazing. They have been gathering food from the jungle, a sack thrown over one shoulder and the obligatory machete in the other. 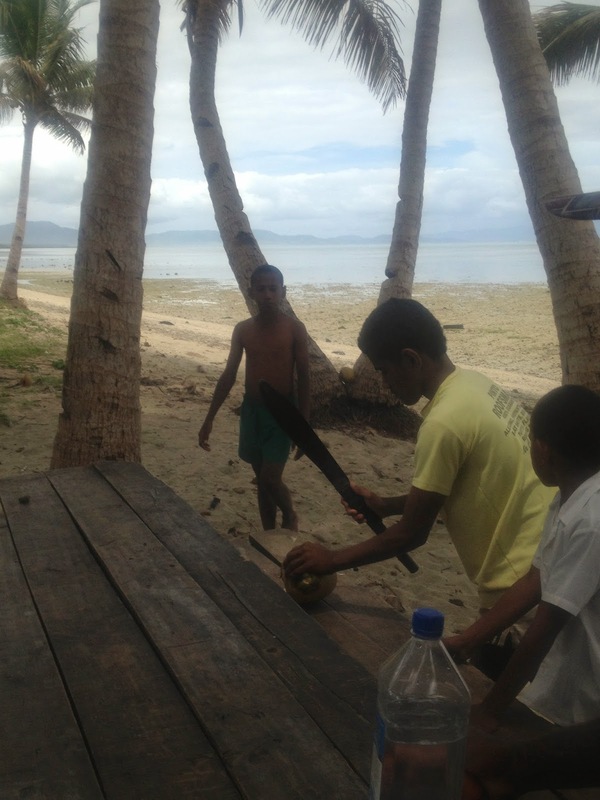 Q’s brother, in a gentlemanly fashion, grabs the machete to get the ladies a replenishing drink in the form of a coconut. The ladies are pleased to meet me and sup their drinks before heading on their way back to the village. Never seen a girl traveller here. Alone, too. They will remember this in the village, Q tells me. The fervour I created was unbeknownst to me. I mean I expected some interest but I realised not that there was an undercurrent of surprise and a wave of chatter about my appearance from the jungle with Q. 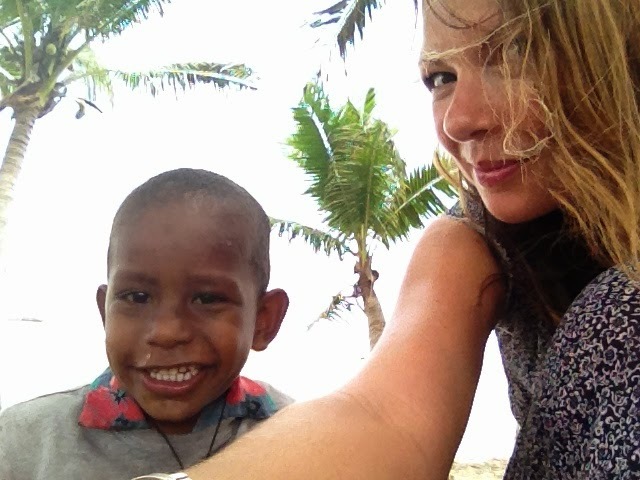 Particularly as my Fijian is somewhat limited and the children and people of the village are so respectful. I think, though, that it is I who will remember this day. In fact, I will treasure my time with Q. Forever. As the bus arrives, we have mere moments to say good bye and we make an arrangement to meet from the bus. 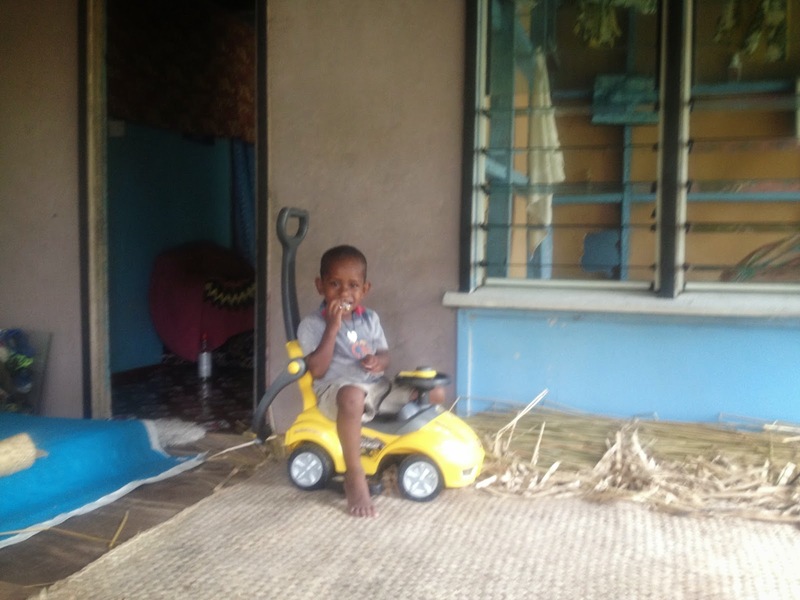 He will delay going to his farm and wait for my return from Taveuni. I can spend another day in the village. They in fact want me to come for Christmas. They are willing to help pay for my flight from Vietnam! But I know I can not accept this. 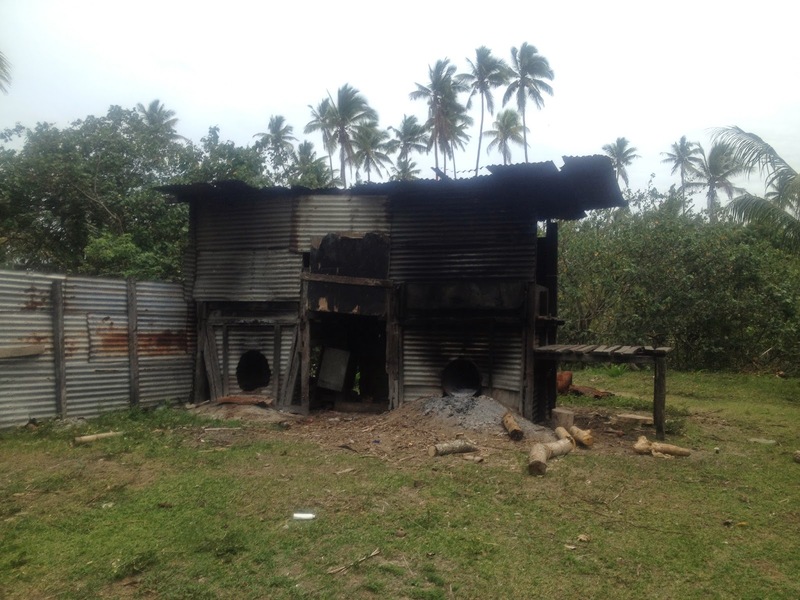 My planned trip to Taveuni does not happen; it is Diwali, a public holiday, and buses will not run. As I reflect on the missed moments whenI could have seen him, tried to find him, I began to see him as some kind of angel. Heaven sent. 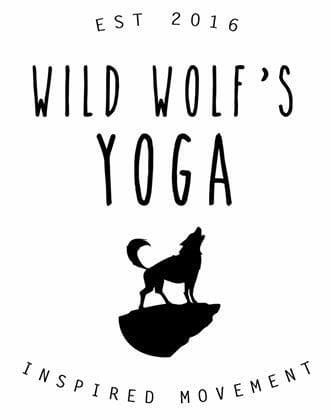 Gracing this earth with his gentle ways and deep understanding of life. Quite, unassuming. Giving and kind, incredibly intuitive. I had seen him, watching as the lovely Labasa lady and I flicked through my desert snapshots. He had not missed a trick. He had clocked me at the bus station. Wondered if the young girls that took me under their wing were friends or a home stay. He realised I was alone and wanted to hear my story and help me in any way he could. He helped above and beyond and I well up as I write this now. He inspired me. I felt our lives in some ways were parallels but in very different settings. I find it hard to imagine him in the city. He seems to belong here, as Chris belongs to Long Beach. I sit and chat with Elizabeth in my Savusavu home. He is so clever, I say to Elizabeth. And so emotionally in touch and intelligent. Oh yes, she says. Still waters run deep. She raises her eyebrows at me. Totally, I reply. Those are the perfect words to describe this rare being. You wrote this story so beautifully Jess – All the feels right now! !